This is also known as rumtopf in Germany, and both France and Germany lay claim to it. I love the French name. A middle-aged man who is left on the shelf is called a vieux garcon in France and presumably, as he has no wife, this is the best thing he can make to provide himself with dessert over the winter. It’s a great lazy way to preserve fruit, as it’s simply layered up with sugar and alcohol (you can use rum, brandy or kirsch). Traditionally you add fruits to the jar as they come into season over the summer, but you can make it all in one go if you prefer. It’s bliss eaten on a cold November day, or at Christmas. You need to use fruit that is just ripe and in perfect condition. The only fruits that aren’t suitable are rhubarb (it gets bitter), normal gooseberries (though you can use the less-tart eating types) and melon (melon is a ‘wet’ fruit so it dilutes the alcohol, thereby increasing the possibility of fermentation or mould). Citrus fruits don’t work well either. Berries get very soft but I don’t mind that (though I think it’s better without strawberries). You are supposed to layer the fruit in a glazed stone or pottery jar, but I prefer to use a glass jar so I can see the fruit. Just make sure to keep it somewhere cool and dark. Wash the fruit and gently dry it. Strawberries should be hulled, raspberries and all currants and grapes need to be removed from their stalks. Halve, stone and slice (or quarter) stone fruits. Spread a layer of fruit on a large tray and sprinkle with the sugar, turning it over so that every part of it is covered. Leave for about an hour. Transfer the sugary fruit to a wide-necked jar and cover completely with alcohol. Put a saucer on top to help keep the fruit submerged, then cover the neck of the jar with cling film and finally a lid. Store in a cool dry place until you are ready to add the next lot of fruit and never stir the mixture until the very end, when you want to serve it. As more fruit becomes available, mix it with half its weight in sugar and go through the whole thing again, replacing the saucer with a clean one and using new cling film. When you have added the last batch of fruit (you can add halved figs and peeled pear slices in early autumn), top up with more alcohol, cover and label. Leave it for at least a month. Top up again with more alcohol if you notice that it needs it (the fruit must be completely covered). Old boy’s jam will keep for a year. Don’t do anything fancy, just serve in bowls or glasses or, as the French do, coffee cups, after a meal. I like crème fraîche with it, too. 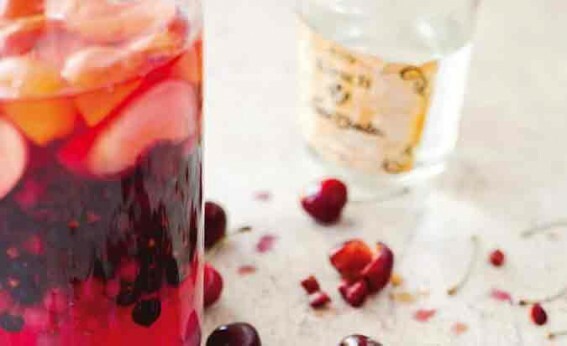 The liquor makes a gorgeous drink, chilled, or add it to sparkling wine.